September 7TH, 2019 - Join the Kronenwetter Fire Department as we honor the memory of the first responders who made the ultimate sacrifice on September 11th, 2001. Sign up for the 5th annual Run for the Fallen to remember those who gave it all and pay tribute to those who continue to serve our communities today. Free Event Tee - Register by August 7th to be guaranteed your correct size! The Run For The Fallen 10K course is a primarily flat course, sprawling through the residential neighborhoods of Kronenwetter, Wisconsin. This course offers plenty of shade and a nice blend of turns and straight stretches for athletes looking to participate in this event. Walking The 10K: Although the 10K is listed as a running event, those interested in walking may also participate as long as they can cover the course in under 1hr 45min. This aids in keeping the start/finish line clear and ready for the 1 Mile Firefighter Challenge at 11:15 am, and the rest of the event on schedule. The Run For The Fallen 5K course is a primarily flat course sprawling through the residential neighborhoods of Kronenwetter, Wisconsin. This course offers plenty of shade and a nice blend of turns and straight stretches for participants looking to run or walk. This event is perfect for all ages, and athletic abilities. Participants looking for an extremely well-organized run/walk event in a friendly, supportive environment will truly enjoy this event. Fire personnel looking for a way to honor the fallen first responders of September 11th are invited to join us for the 1 Mile Firefighter Challenge. Firefighters are encouraged to run or walk the mile-long course in full turnout gear as a tribute to those who gave their lives 18 years ago. 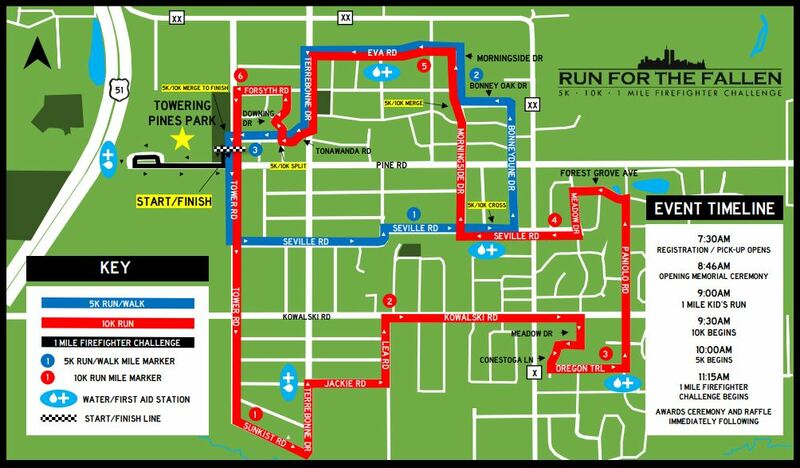 The Run For The Fallen 1 Mile Firefighter Challenge Course is a nice, flat, down and back route spanning Pine Road (west) down to Evergreen Elementary. Do you have a child that loves to run? Come down to Towering Pines Park at 9:00 AM for the 1 Mile Kid’s Fun Run! This event is geared for children under the age of 13 and is a great warm up for parents or guardians to run in prior to the 5k or 10k events. The event will be located at Towering Pines Park, 2355 Tower Rd, Kronenwater WI, 54455, located about three hours drive east of Minneapolis along I-94 and US-10. Go to the official Run for the Fallen website (under the "volunteer" tab) to sign up as a volunteer! Volunteers assisting with Run for the Fallen must be over the age of 18, or accompanied by a parent, guardian or chaperone that is at least 18 years old. ​ Volunteers must be able to follow written or verbal instructions as provided by Event Staff. During their shift, Volunteers are expected to devote their full attention to Run for the Fallen, and maintain respectful, professional conduct at all times. ​Volunteers signing up as a group will have all group members shirts assembled in one bag for the ease and speed of pick-up. Photographers - Help us capture Run for the Fallen by taking event photos. Your pictures will be shared on social media, our website and with the National Fallen Firefighters Foundation. Course Attendants - Assist participants as they navigate the more challenging areas of the courses by signing up as a Course Attendant. This position requires volunteers to direct 5K and 10K participants on key areas of the route with color coded flags. Volunteers will be provided with safety vests and flags. Water Station Attendants - Keep participants hydrated by manning a water station. Water stations are a great volunteer opportunity for families, groups of friends or sponsors. Each water station requires a minimum of 3 volunteers. Each station will be equipped with first aid, folding table, water, cups, 4 gallon dog waterer, dog clean-up materials and garbage bags. Athlete Encouragement - Cheer on and encourage athletes as they participate in Run for the Fallen. With locations on the 5K, 10K, 1 Mile Firefighter Challenge Route and start/finish line area, there are a number of opportunities to support athletes as the run in honor of the fallen first responders of 9/11. Parking Attendants - Assist athletes, sponsors and spectators with by signing up to be a Parking Attendant. Parking Attendants will be provided with a safety vest and list of designated parking areas upon arriving at Towering Pines Park. Greenheck EMR - Provide emergency medical care at water stations on the 5K, 10K and 1 Mile routes. Water/First AID: This course offers four water stations and first aid stations. Water and first aid will also be available at Towering Pines Park. Restrooms: Restrooms are available at Towering Pines Park. Timing: Chip timed event – Timing services provided by Tortoise & Hare Race Management. How was Run For The Fallen?